If you want to be capable of capturing recordings beyond the quality of all-in-one USB desktop microphones, you’re going to need an audio interface. However, that doesn’t necessarily mean you need to break the bank. FilmToolKit has put together this excellent list to help you find the best audio interface under 200 dollars. Whether you’re a lone wolf, a podcaster, or a musician with lots of instruments, we’ll make sure to help you find the perfect mixer to suit your needs. 1.1 Why Spend Less Than 200 Dollars On An Audio Interface? 3.1 How many inputs and outputs do I need? Why Spend Less Than 200 Dollars On An Audio Interface? Are cheaper audio interfaces really worth it? Can they compete with more expensive products? We think so! Here’s why. You may just need something simple and cheap for your hobbies. Many of them are still capable of producing professional-grade recordings. They’re often very simple to operate. You can put the money you save towards a more expensive microphone, further improving your audio quality. You can always upgrade later! The best of the best. If you check out just about any “best cheap audio interface” guide on the internet, you’ll usually find this one sitting squarely at the top. At the 200-or-less price point, this mixer simply out classes the competition in every single category. This is a very safe purchase. So why is it our number one pick? Lets talk briefly about why this is the best audio interface under 200 dollars. The Focusrite 2i2 was the best choice for a long time for it’s high quality construction, pre-amps, and consistency. It does everything you need it to do better than anyone else does at the given price point. It has been beloved for its reliable hardware and its sleek design. It’s still available for about 50 dollars cheaper. The Scarlett 2i4 is the next iteration that takes the already great interface to a whole new level with several critical features. First of all, it has a new pad button that works to attenuate the gain of loud signals, reducing clipping on things like super-hot guitar riffs. This is very important for most musicians. The 4 channel outputs allow you to monitor two different sounds between your speakers and headphones, which is particularly useful for laptop DJs who need to monitor things before they play them. Finally, it features a MIDI port, which is a very useful feature if you’re a pianist or use some sort of MIDI controller. This will prevent you from needing to buy a separate adapter. What makes this by far the best value on the market however, is the bundled software. By including basic DAW tools like Ableton Live Lite, 2GB of samples fro loopmasters, and several other packs of sound effects, the Focusrite 2i4 is easily the best audio interface for beginners. Our Verdict: Unless you need to record more than two inputs at once, this is the definitive choice. Extremely high quality, sleek design, and enough bonuses to make it a much better value than the competitors. When we were making this list, we tried to include multiple models from different brands for the sake of variance. We looked at many audio interfaces around the 150 dollar price point. Surprisingly, we were completely unable to find anything we feel as comfortable recommending as the Focusrite Scarlett 2i2. It seems like most other options this cheap suffer from things like OS incompatibility, distorted audio, and pathetic longevity. The 2i2 However manages to be just as reliable with the 2i4, albeit less versatile. As mentioned above, this is a more feature-light (but still excellent) variation of the Scarlett 2i4. It has the same high quality preamps, the same sleek form factor, and the same amount of inputs as the 2i4. Sure, it doesn’t have the pad buttons for loud guitar solos, or the outputs for to monitor your live DJ set, but not everybody needs that. We would even go so far as to say that if you are not an audiophile, but simply someone looking for a simple solution, this choice will make your life a little less complicated than the more expensive model. It even comes with all the great software bundled with the 2i4 to help you get started on your musical journey! Our Verdict: If you simply need to hook up one or two mics, and won’t be dealing with instruments, this is a great way to save money and simplify your recording setup. The Focusrites we recommended above are simply not going to be beat by anyone else in their price range. However, there are some higher-budget options that can be found at a hefty discount. The UR44 is an interface that, for a long time, retailed at nearly $400. In recent times, it has been available for around $200. With Six inputs, this is our definite choice for anyone who does podcasts, or any other type of work that involves collaborators. There’s two headphone outputs with two different mixes, which is an absolute necessity if you’ll be recording music with others. It even has MIDI I/O for your keyboards and soundpads. Whats even better is that the four inputs feature premium Class A D-Pre Yamaha Preamps. These are very high quality Preamps, and outshine almost all of the competition at this price point. Another thing that we like is that this interface utilizes an external power supply rather than USB power. This means that your microphones will be steadily powered and not be subject to the notorious power fluctuations of USB. The build quality is exceptionally rugged metal, and it feels like you could literally chuck the thing at a wall for good luck before recording and still not run into any problems. While all you really need to start recording yourself is an XLR mic and an audio interface, there are several accessories you should consider investing in if you truly want to get the most out of your recordings. Here is a comprehensive list. Ah yes, the first microphone accessory most recording artists find themselves investing in. You ever notice that some audio clips will have an annoying popping sound when words starting with the letter P or B are said too close to the microphone. Pop filters are a relatively cheap way to eliminate this problem and set yourself apart from the unassuming amateurs. Here’s one you can get for less than $8! What the Cloudlifter does is takes the phantom power from your interface and uses it to add 25db of clean gain to your microphone before it hits the interface, effectively raising the noise floor. Whether or not you should get this will be largely dependent on what type of microphone you are doing your recording on. Mics like the Shure SM7B typically are not going to get nearly enough gain from a cheap sub-200 dollar mixer. You should be fine when recording louder things, but when you try to record quieter vocals or dialogue,you will notice a lot of white noise when you adjust your audio levels after recording. With cheap audio interfaces and expensive mics, buying a cloudlifter is a no-brainer. You can buy a $500 microphone and plug it into a $200 mixer, but you’re still going to sound totally unprofessional if the acoustics of your recording area are not on point. Acoustic Padding has the potential to add a ton of production value to your audio quality if your acoustics are disadvantageous. This listing offers 12 packs of acoustic paneling for less than $20! If your recording equipment is set up in a corner, we suggest purchasing two packs to stick to the corner walls. Four or five packs will be enough to sparingly cover an entire room and a ceiling. Note: Don’t forget, you’ll need to purchase the proper adhesive to attach it to your walls! The primary acoustic reflections you will be dealing with will be those that are bouncing off the walls behind your set-up, so applying these to those areas will achieve the best results. Check out this amazing video I watched before deciding to acoustically treat my recording studio. I was immediately sold. The difference is night and day. The corner acoustic pieces seen in the video are called Bass Traps, and can be purchased here. You probably won’t realize you need one of these until you receive your microphone and notice it didn’t come with anything to hold it up with. Yeah, it’s a little more expensive. There are many options on Amazon that are cheaper. However, Rode is known for making some of the best audio-related equipment in the industry. We don’t think you should skimp on this. This product feels truly premium, and do you really want a cheap mic arm to fail and drop your expensive microphone? Of course, unless you’re strictly a live streamer, you’re going to need to consider what software you will use to record your audio with. We have two recommendations. Audacity. It’s free, straightforward, and used by millions of content creators. It will most certainly get the job done for all simple recording needs. Adobe Audition. While Audacity is capable of capturing your recordings, it leaves a lot to be desired. It lacks a lot of features premium DAWs have, and the experience can be pretty clunky as a whole. Adobe Audition is a great piece of software that has pretty much EVERY sound editing feature you would ever need. It’s popular among content creators and industry professionals, and will be the last program you ever need. If you’re serious about your recordings, consider investing in Audition. Audition is available for only $19.99 a month, or $49.99 a month bundled with other vitally important software like illustrator and Adobe Premiere. Bonus: If you’re a student, teacher, or know one, you can get access to the entire creative suite, including audition, for only $19.99 a month. When dealing with low-budget audio interfaces, there aren’t many factors that you’re going to have control over. One important thing to consider, however, is the amount of inputs and outputs you will be requiring. If you’re going to be running a podcast, it’s very important that you get an interface that allows for between 2-4 input ports. One for you, then one-three for people you may have on as guests. If you’re a musician, we recommend going with an interface with more ports, so you will be capable of using a guitar, or multiple mics simultaneously. If you’re just doing voice over work, or making YouTube videos by yourself, then a cheaper interface with just 2, or even 1 port will get the job done for you. Like we mentioned before, if your interface doesn’t include adequate pre-amps, certain mics may not perform to the level of quality they are supposed to. You’ll need to research your microphone or other device individually to find out what it’s going to require. For the interfaces we reviewed, we made sure to break down the type of pre-amp and what kind of devices will perform well with it. If you decide to go with an interface not listed in this guide, do some quick google searches to determine if the pre-amps will be enough to sufficiently drive your mic. If they’re not, you can always get a cloudlifter! If you are a simple consumer with simple needs, you might just want the interface that looks the prettiest! After all, all of our recommendations are solid choices, so picking one based on looks alone is totally valid. Of course size is important as well, but we’ve found that in this price range most of the audio interfaces are around the same size. Only if you’re getting one with 4 or more inputs will the width begin to increase. If you use devices like keyboards or other types of midi controllers, you’ll need to invest in an audio interface that has MIDI I/O ports. 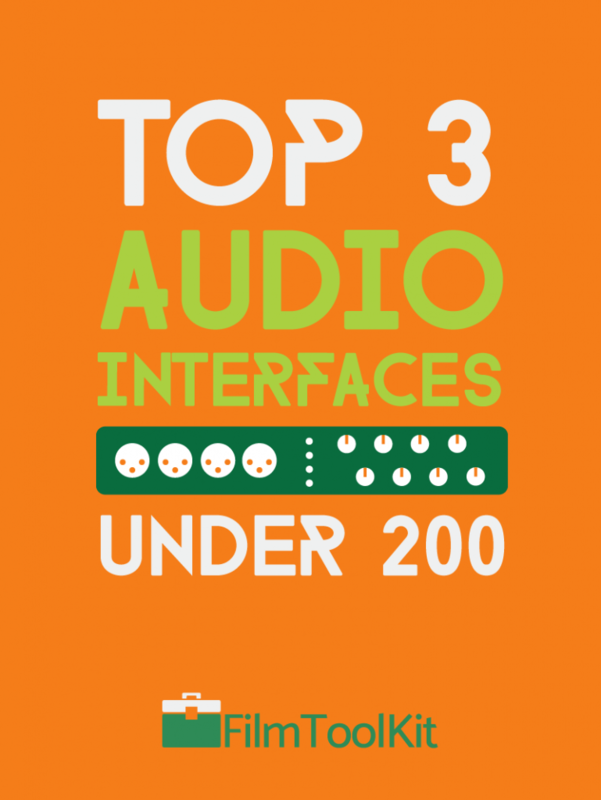 Do note, that all of the interfaces on this list have at most one midi port. If you want more, you’ll need to either spend more money, or get a dedicated midi interface. If you’re an established musician or vocalist who has been doing audio work for awhile, you likely already have some premium audio software like Adobe Audition or Ableton Live. However, if you’re starting from scratch and need some basic software to begin your audio work, some of our choices (namely, The Focusrite), include licenses for some pretty great DAW programs.